Click HERE to donate to the Celebrating the voice of Lois Costello recording project. Dwayne Estes can trace his family and musical roots to Mulenberg and Hopkins counties in Western Kentucky, a place where music just runs in the water. Raised in Evansville, Indiana, Dwayne was first drawn to the piano at age three at the church his grandfather pastored in the hills of Kentucky. He started formal piano study at age nine, but formal study was difficult for him as he had learned early on to play by ear, picking out melodies and basic chords. It was in high school when Dwayne began to get serious about music. High school choral director, Dr. James Haygood and Larry Eifler, instrumental music director, opened the world of music for him. “I was exposed to all music, I mean Bach to rock." Dwayne excelled as a Pianist for the jazz ensemble and as an accompanist for all campus vocal groups. This was fertile ground for developing his musical reading skill and allowed him to take on this new identity as a musician. While in high school, Dwayne started gigging in and around the Evansville, Indiana area for several years. After graduating from high school, Dwayne continued to gig and in the fall of 1982 entered the University of Evansville to pursue a degree in music. Dwayne struggled with his academic endeavors, leaving the University of Evansville to attend Belmont University in Nashville, Tennessee. This struggle with school did not deter Dwayne from performing. Still in Nashville and while at Belmont, Dwayne took an opportunity to work for the Nashville City Club as the house pianist and band leader. Dwayne also played on multiple demonstration recording sessions for fellow students. It was this work that gave Dwayne the drive and understanding of the commitment it would take to earn his music degree. With a new sense of purpose and direction, Dwayne headed for St. Louis, Missouri and Webster University. At Webster, Dwayne studied piano with the incomparable jazz pianist and instructor Carolbeth True, improvisation with Paul Demarinis and scoring and arranging with Kim Portnoy. After graduating with a Bachelor of Music degree in 1990, it was back to Nashville to work for Opryland USA as a show leader/conductor. Opryland USA was the only theme park that had live music performed by live musicians, singers and dancers all the time. Dwayne continued to perform outside of Opryland, working to establish himself through multiple musical outlets. Not wanting to be a touring musician, and Opryland ending, Dwayne decided it was as good a time as any to head back to St. Louis and Webster University to pursue a master’s degree. While in graduate school, Dwayne had a freak accident which lead to him losing his sight. “Blindness is a nuisance. I don’t have to like it, I just have to live with it." Even with the loss of his sight, Dwayne completed the master’s program, giving a graduate recital with full orchestrations, including eighteen musicians and twenty singers preforming Dwayne’s original arrangements done with longtime friend and colleague Steven Milloy. In 2004 Dwayne founded Some Fun Productions. The Some Fun band has performed at many events. In 2010 and 2011 the Some Fun Big Band performed at Stages St. Louis annual fundraising gala, accompanying some of Broadway’s biggest stars, using original arrangements by the finest local arrangers. In 2006 Dwayne released his first CD recording as leader. 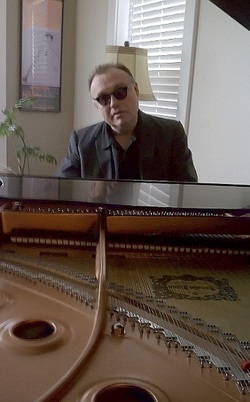 Titled Blind Ambition, his CD encompasses nine tunes and one original tune. “Each tune on this album has special significance to me, and the blues tune I wrote sounds sort of Monk-esque." The recording is available on iTunes.com. The tunes from the CD are played on WSIE and KDHX. Additionally KSDK Show me St. Louis did a great profile on Dwayne that helped CD sales.CD sales continue and today working with a smaller group of musicians Some Fun is back on the scene entertaining throughout the area. Dwayne is also teaching jazz improvisation and musical styles. In the near future look for Some Fun Productions’ involvement in several projects including recording long time band singer Lois Costello, who is still performing at age 85, has impeccable time and a lot of vocal ability. Dwayne plans on recording the songs of his uncle Eddy Gaines, legendary Rock-a-billy/country singer song writer of the 1950’s and early 1960’s. Dwayne is thriving personally and professionally. He says, “Folks, get out and hear some live music or go to a live theater show; it will do your soul a whole lot of good."